I use a 4 x 5 inch view camera to make most of my photographs. Together with the required tripod and all the other paraphernalia, it weighs almost thirty pounds. Multi-day backpacking trips with my view camera have always been a labor of love, but now the emphasis seems to be more on labor and less on love. Fortunately, my kayak and canoe do not mind at all. 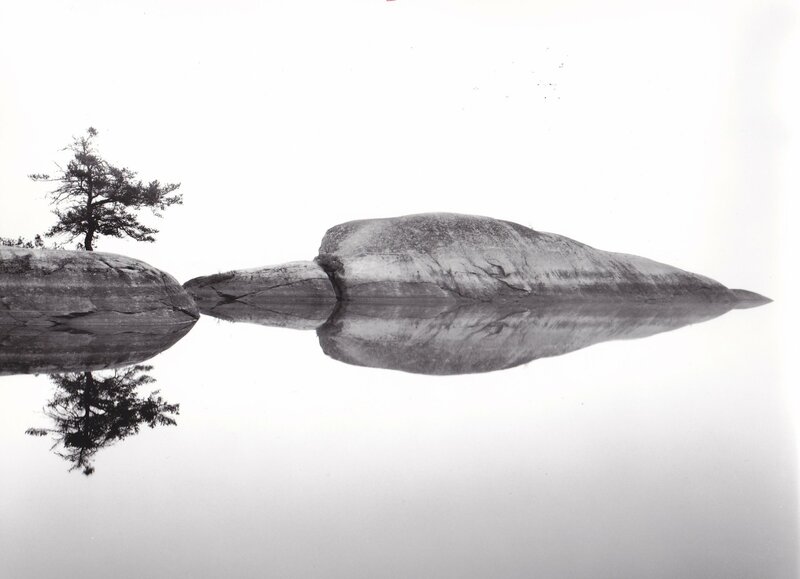 The negative of “Rocks Near Show” was exposed on the third morning of a four day trip on Holeb Pond in northern Maine. It was October, and there was a moderately dense fog on the lake; visibility was perhaps fifty yards. That time of year lakes are often warmer than the air in the morning. Water evaporates off the warm lake and condenses in the cooler air to create fog. The sun must have been above the horizon because the fog was bright. As I was composing the image on the ground glass of my view camera, the word “trite” crossed my mind. Millions of people have taken pictures on rocks or trees reflected in the still water of a lake. I made the photograph anyway, hoping that the quality of the light, the tension between the dynamic shape of the rocks and the stillness of the water, and the slightly broken water line formed by the four rocks would convey a sense of disorientation that often occurs in a fog.